Edit PDF files now! You can write annotations, add text, change the text (correct spell errors) or delete words completely. Now you can also add or delete pictures and vector graphics and add text in any font you want! With the 11 new tools you can move and zoom the text and pictures and you can edit text blocks, insert empty lines or change the line breaks freely. As you know it from a text editor. Version 2.0 is able to underline, highlight and strikeout texts and edit the bookmarks. You are able to change the order of the pages or delete pages. Also you can hide the information on a page so that they are invisible in the Acrobat Reader and you can show them later. You can change the page size or move the content. Add stamps like "Confidential" or "Top secret". The source code of the page (a language like HTML) is also editable for you. The program can read and write encrypted pdf files. The program leaves the layout untouched after saving if you don't want to change it. Like PDF Editor, but with the Pro version you can also add new form fields (Form fields/Add new text field). The demo version has the form functions of the PRO version enabled. 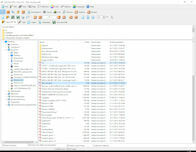 You can use PDF Editor in your company on all computers for as many users as you have as long as no more than 10 users run PDF Editor at the same time (Citrix etc.). If you need 30 concurrent users you can order this product 3 times. Like PDF Editor Pro, but with additional features. With "PDF Editor Objects" you can export as DXF, SVG and EMF. You can recognize lines in pictures and save them as dxf file. You can compress existing pictures and shrink the file size of the pdf file. You can also save the file in the PDF/A 1b format. 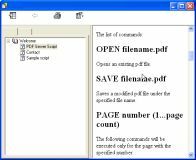 With PDF to Word you can open a pdf file and save the content of the document as word file. The program maintains the layout, that means the position of the text, the pictures and the vector graphics.But this is of cause no lossless conversion but the most important thing can be maintained. 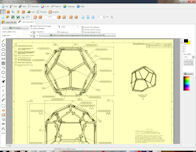 If you want to edit PDF files completely lossless then you should use our CAD-KAS PDF Editor. Are your pdf files to big? With PDF Shrink you have to ultimate tool to compress existing pdf files. The program compresses all pictures in the pdf file with the JPEG2000 (color pictures) or the JBIG2 (b/w pictures) compression. You can choose the resulting size for the JPEG2000 pictures. If your files does not contain big pictures but many line objects (CAD file) or many embedded fonts our program can help you too. Now you can create you digital photo albums as professional PDF files! You can then print and distribute them, burn them on a CD, send them with email or publish them on internet! The advantage is that everyone can view your photoalbum exactly as you wanted it with the Acrobat Reader and nobody needs to have a special software to display the album. You can give away or store your picture in a very compact way. Add your letter paper behind existing or new created pdf documents. Choose the letter paper pdf files as well as one or many source pdf files. The program copies the content of the letter paper pdf files into the background of the selected source pdf files. You can add you logo or your complete letter head to your pdf files. Simply add a watermark (text and pictures) to all of your PDF files with one mouse click! This will mark you files as your copyrighted property. You can add the watermark behind all objects (behind existing text) or print it over existing text. You can number the pages of existing PDF files or add you company logo or your Copyright message. You can process as much files as you want with one mouse click. Convert Word files into PDF files with one mouse click! The program read Word files directs and writes PDF file directly. So you do not need Word to be installed and you do not need Acrobat Reader to be installed. You do not need to install any printer driver or something. You double click on the Word file and then the program displays the word file and then you can convert it into PDF file format with one click on Go!. Protect PDF files against unauthorized access and encrypt them! The program limits the access to PDF documents. You decide if a PDF file can be printed in Acrobat Reader or if somebody may copy or edit the text. You can decide if the user have to enter a password in order to view the file. It is also possible to decrypt PDF files. If they are protected by a password you have to know the password in order to decrypt the file. 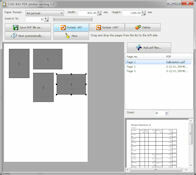 Convert PDF files into pictures (JPG, BMP etc...) or into PDF files with only one picture of the content per page. This way nobody can modify your pdf files because there is no text information. It is like you would printout the pdf file, scan it and save the scanned picture as pdf file. This is the only way to protect the file against changes. 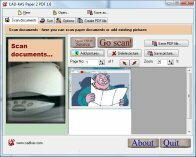 PDF Reader is a free program to view, modify and print pdf files. It is very small, only about 4 MByte to download and will fit on one disk. You can open, view, zoom and print PDF files. You can also modify pdf files (but you can not save them in the free version). You can add, change and delete text and pictures and print it out. You can't simply open PDF files in Word and edit them... Wrong! PDF 2 HTML can open PDF files. It recognizes the texts, the layout and many graphics. Then you can save this as HTML, RTF or TXT file. You can open these files in Word or Frontpage etc. So you are ready to upload your documents to the internet. And anybody can view HTML files instantly. You need only one click to save all the found images in a folder of your choice.